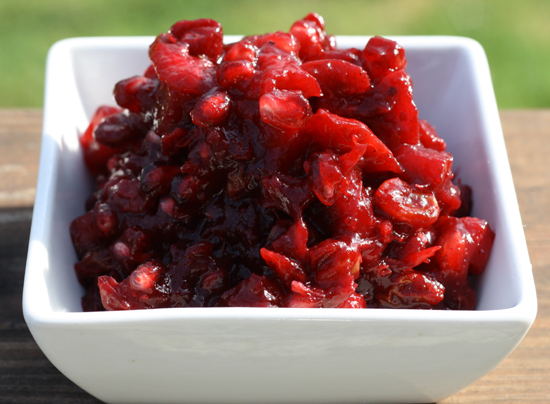 I’m always a bit sad that it seems to take so much sugar to make cranberry sauce taste good, so I came up with this delicious mostly fruit-sweetened version. I love the flavor of pomegranate so I’ve used it in three different ways in this low sugar cranberry sauce: pomegranate juice, pomegranate molasses, and fresh pomegranate arils. 1. Put the cranberries and pomegranate juice in a cast-iron skillet over medium-high heat. Bring to a boil, then reduce heat to simmer and cook for 5 minutes. 2. Add pomegranate molasses, ginger, raisins, apple, cinnamon and vanilla extract. Mix well and continue to cook for about 5 more minutes. 3. Remove from the heat and allow to cool completely before add the fresh pomegranate arils. Wow! That sounds absolutely wonderful! I love the idea of combining pomegranate with cranberry =D.